With the goal of inspiring a generation of compassionate change-makers and enhancing positive school community engagement, the Compassionate Communities Award supports and recognizes excellence in student-led projects that create a school-wide community of compassion, stewardship, and respect. 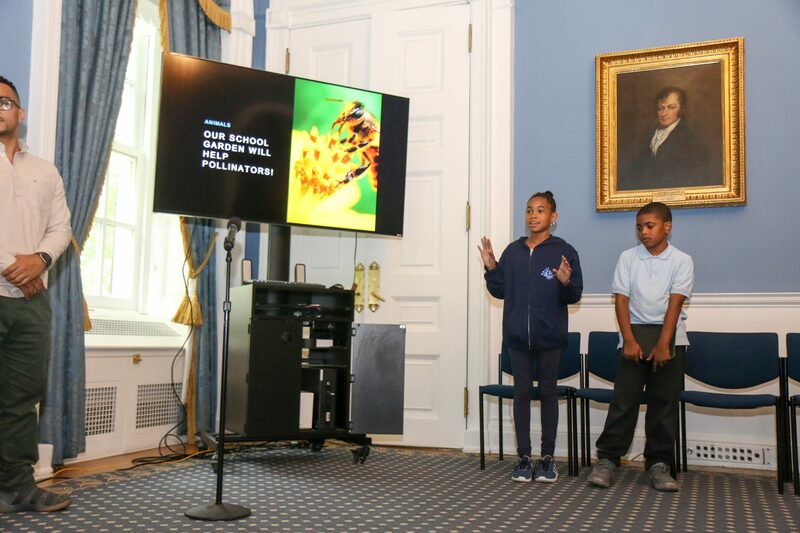 HEART launched the Compassionate Communities competition in partnership with the NYC Mayor’s Office and Department of Education. During the 2017-18 school year, more than 14,000 students from 21 elementary schools in Bronx District 8 participated in HEART programming and developed service projects to inspire respect, empathy, and social action. We structured our competition around the concept of community because we believe that life-long compassionate engagement can be most powerfully awakened in individual students when it is expressed in all aspects of the community that guides and sustains them. Each participating school is asked to develop and implement lessons, activities, and service projects within their school community that reflect upon the meaningful connections between the needs of the people in their neighborhoods, and those of the animals with whom we also share the world: our companions, farm animals, and our wild animal neighbors. Throughout the year, HEART staff members provide a menu of theme-based curricular materials, activities, and projects that participating schools can use to create new programs or expand any of their existing programs that promote respect for all, animal welfare, and environmental sustainability. At the end of the year, students from each school submit a multi-media presentation highlighting their Compassionate Communities activities and accomplishments of the year. An esteemed panel of judges selects a winning school to receive a $5,000-$10,000 gift from HEART. The award funds projects of the school’s choice that support the goals of the Compassionate Communities program and address meaningful needs within both the school and the wider community.